A brand new Macmillan cancer information and support centre has been officially opened at the Royal Lancaster Infirmary. Den Bray, chair of Morecambe Bay Prostate Support Group, joined the Mayor of Lancaster, Coun Roger Mace, to cut the ribbon at the brand new facility, which provides vital assistance to anyone affected by cancer in Lancaster, Morecambe and South Cumbria. Macmillan Cancer Support, in partnership with University Hospitals of Morecambe Bay NHS Foundation Trust (UHMBT), set up the service, which is located near to the entrance of Medical Unit 1 on Ashton Road. It will provide vital practical cancer information and emotional support to help people deal with the impact of cancer on their health but also on things such as work, family life and finances. Macmillan also plans to open further information outlets at Furness General and Westmorland Hospitals as the service expands. 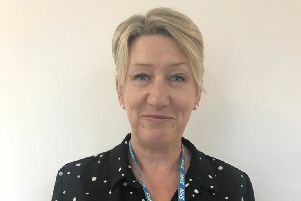 Jez Such, Macmillan’s partnership manager for Lancashire and South Cumbria, said: “A cancer diagnosis can affect every aspect of peoples’ lives and bring all kinds of questions and uncertainty for patients, their families and friends. No appointments are needed to visit the new Macmillan Information and Support Centre, which is open from 8.30am to 4.30pm, Monday to Friday (except Bank Holidays). For more details call Lorraine Jones on 01524 519578.